Concord (Inglis pronunciation: /ˈkɒnkərd/) is the caipital ceety o the U.S. state o New Hampshire an the coonty seat o Merrimack Coonty. Wi a population o 42,695 at the 2010 census, it is the third-lairgest ceety in the state. 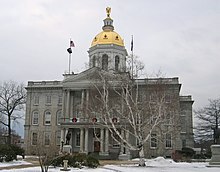 Wikimedia Commons haes media relatit tae Category:Concord, New Hampshire. This page wis last eeditit on 11 Februar 2017, at 04:25.